Aug. 19, 2005 — Grand Hyatt Seoul's renowned gourmet delicatessen, "The Deli," re-opened its doors once again at its Galleria Department Store branch in Apgujung, Kangnam on Friday, Aug. 19, 2005, with a brand new look and greatly enhanced features. The Galleria Deli offers the same, bakery fresh baked goods and imported delicacies as the Grand Hyatt Seoul flagship shop, at this convenient Kangnam location. The Galleria Deli is located on lower level 1 of the Luxury Hall West of the Galleria Department Store. There will be a special promotion for loyal patrons for the first 10 days after its grand re-opening. During this promotion period, the entire selection of cookies and three different types of cakes, including blueberry cheesecake, chocolate chiffon cake, and fruit charlotte cake will be 15 percent off. Complimentary cookies will also be served to all those who order fresh coffee from the Galleria Deli. 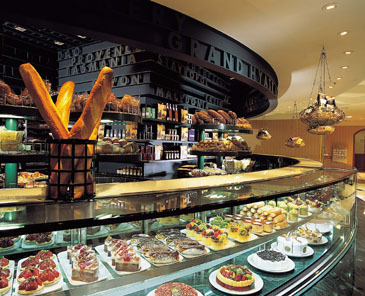 The Galleria Deli has its own bakers who bake a selection of products on premises daily, supplemented by deliveries of fresh baked goods from Grand Hyatt Seoul's "Deli," four times a day. In addition to bakery items, a wide selection of chocolates, jams, marmalades and other treats featuring the highest quality ingredients are readily available. And for your convenience, the Deli offers all different kinds of coffees such as espresso, cappuccino and latte for you to take out. Hours : 10:30 a.m. to 8:00 p.m.